Spanish by the river - Boquete, is in a quiet area with a beautiful and colorful tropical garden with orange, pineapple and comfortable places to relax. Wi-Fi, free parking, and we can propose activities (cooking classes, latin dance classes, yoga, zumba). It is an ideal place to stay for a while and feel like at home ! The office is open 7/7 from 8am at 8pm to plan hikes. We are located in Alto Boquete, a little before Boquete down town . next to it and walk up the road 180 metres, we have a sign on the road say SPANISH-LANGUAGE SCHOOL. 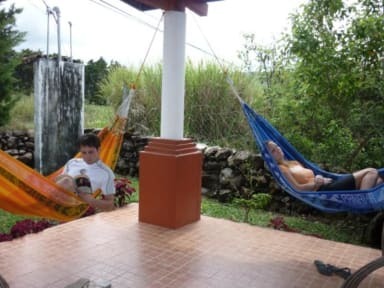 The hostel is part of a Spanish school to learn and enjoy the Panama, our hostel is located in Alto Boquete just 5 km (10 minutes by taxi) from downtown. It is easy to go into town with the shared safe taxi available 24/24 7/7 for only 0.60cts (day every 5-10 minutes) and $1.00 (night every 30/45 minutes) frequently passing by the main road, just 180 meters from the school. Spanish by the river has 3 bright shared rooms of two bunks beds and 1 private room with private bathroom with garden views, and 2 shared baths for 8 people in total, a living area with cable TV , music player and DVD, fully equipped kitchen. Enjoy our garden and terrace with hammocks drinking a cup of coffee or tea, which is free all day. We propose breakfast for $6 per person. There are a supermarket to 100 meters, opening 8AM / 8PM 7/7. Our property is 45 minutes drive from the center of the city of David, and 1 hour drive from Enrique Malek International Airport. - Tree climbing, rafting ..
- Hike the Baru volcano at night to see the beautiful sunrise. - Cash only accepted on arrival.